What’s It About? 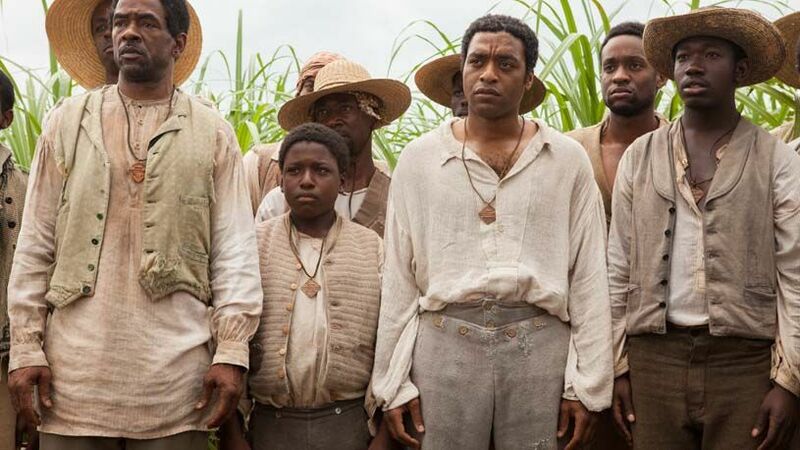 Adapted from a novel of the same name and winner of three Oscars, 12 Years a Slave traces the tragic story of Solomon Northup (Chiwetel Ejiofor) and his journey to slavery in the cotton-picking plantations of Louisiana. Solomon Northup, a freeman, lives a successful life in New York working as a violinist with his wife and children. However, Solomon is duped by two charismatic businessmen, who offer to pay handsomely for musical services in Washington D.C. After a lavish celebratory dinner, Solomon awakens to find himself chained to the floor. 12 Years a Slave portrays the true story of Solomon’s decline from riches, soon becoming the property of sadistic slave owners and sufferer of brutal slavery in the Deep South. Verdict? Director Steve McQueen (Shame, Hunger) long ago carved his name as a talented force, and his drive and enthusiasm in 12 Years a Slave saturates the entirety of the motion picture. Chiwetel Ejiofor flawlessly conveys his character’s naivety and incredulousness about the kidnapping – and an early beating drums in the gravity of Solomon’s situation. While Solomon thrashes in the opening scenes, endeavouring to break his chains, the sight of his obedience to the white master later in the film is truly symbolic of the cruel injustice. The black captives are mere dogs to the white slave traders and treated as such. McQueen depicts the absurdness of the trade in a scene where slaves stand ornamentally in a room, and potential buyers scan the floor for a trophy. Freeman (Paul Giamatti), the auctioneer, prances across the floor parading the attributes of his cattle – the burly muscles of one, the beauty of a young girl and the tremendous talent of Solomon. In the midst of the exchange, Eliza (Adepero Odye) pleads with buyers not to separate mother and her children.The cruelty of Eliza’s treatment is heartbreaking as the slave’s fingers are pried away from her crying children and the entire façade of slavery is exposed. Beaten, muzzled and stripped, Solomon is sold to Ford (Benedict Cumberbatch), a church minister and relatively benevolent owner of a plantation in Louisiana. At first, Solomon is able to excel in the field, but he soon generates the jealousy of Tibeats (Paul Dano), a racist farmhand who oversees the slaves. Dano is brilliant, forcing slaves to clap hands in beat to bigoted lyrics and effectively depicts a deep-routed racism with nauseating ease. 12 Years a Slave refuses to s hy from the brutal realities of slavery. As punishment for violent behaviour, Solomon is hung from a tree, surviving on tiptoes that slide in churned mud. A lengthy, difficult-to-watch and unedited scene reveals the day-to-day bustle of the plantation as Solomon gasps for air – children play on the lawn as a black man hangs from a noose. McQueen’s gruesome scene ends, eventually, with Ford arriving to sever the rope. But Solomon is by no means safe, and despite confiding in Ford with his freeman status, the minister sells the slave to Edwin Epps (Michael Fassbender). Epps is a sadistic, backbreaking master who believes God sanctions the abuse of slaves. Epps demands his slaves pick at least 200 pounds of cotton a day, or face the excruciating strike of his whip. Oscar winner for Best Supporting Actress Lupita Nyong’o delivers a heartbreaking debut performance as Patsey, the young slave who picks 500 pounds of cotton each day in a bid to ensure her survival. In Patsey, McQueen depicts one of the most serious tragedies of the slave trade, with Fassbender harrowingly flaunting the many shades of his sadistic character. A profound combination of lust and hatred causes the most unspeakable of deeds as the slave girl is raped, beaten and abused – egged on by Epps’ wife (Sarah Paulson), jealous of her husband’s desire. Lupita Nyong’o injects a remarkable majesty to the character, but the welts of slavery shatter her spirit. Steve McQueen expects maximum application from his actors; Fassbender starved himself in Hunger and inhabited a state of humiliation for Shame. For 12 Years a Slave, McQueen clearly demanded an educated cast, and, as such, a master class in acting is delivered across the board. McQueen and John Ridley (screenplay), via commitment to craft and a fabulous collection of actors, resurrect Solomon Northup’s ink. 12 Years a Slave is realistic, teetering on docudrama – and only the sensationalism of the film score reminds us that this is a motion picture, not simply the bones of tragedy. An impressive range of costume fosters the film’s historical accuracy and McQueen’s picture tunes in all senses to appreciate the plight of the slaves. The camera resists revealing a panoramic view of the landscape, and the effect is choking. There is no exit. Symbolic, too, of Solomon’s slavery is that his freedom relies on the voice of a white man – he has no say in attaining his liberation. It isn’t until Canadian worker Bass (Brad Pitt) posts a letter, that Solomon’s quest for emancipation garners momentum. 12 Years a Slave is frightenin gly powerful and the most important film since Schindler’s List. McQueen is unperturbed to shy away from the misery and violence, committed to giving justice to Solomon’s story. And Chiwetel Ejiofor, in turn, revives Solomon’s legacy, moulding himself faultlessly into the character, providing the best performance ever seen to fall short of winning an Oscar. Extras: A fascinating collection of extras consists of Chiwetel Ejiofor reading riveting extracts from Solomon’s book, insightful cast interviews and a featurette on developing the score. Final Words: Audiences will admire the flawless cinematography and even Brad Pitt’s awry accent doesn’t distract from the magnitude of 12 Years a Slave. Black men, lynched like dogs, will remain etched in the senses of all who view this traumatic picture.